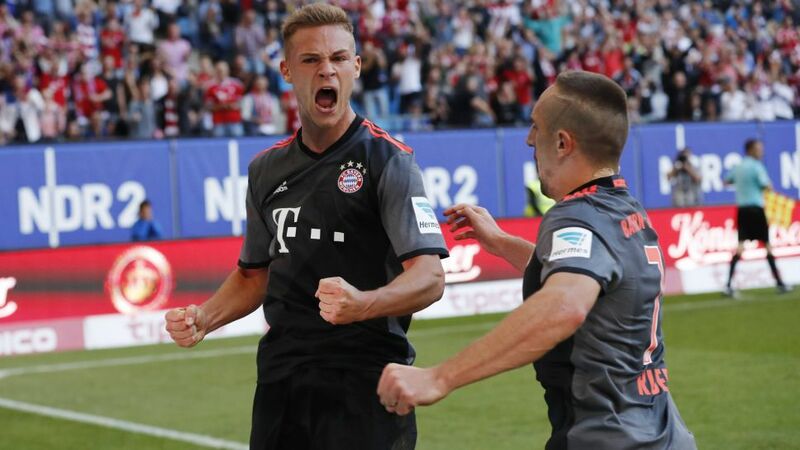 Joshua Kimmich was converted to a central defender by Pep Guardiola last season, and his successor Carlo Ancelotti appears to have transformed him into a goal machine, with four coming from his last four games. After a 1-0 win over Hamburger SV on Matchday 5, with Kimmich netting the decisive goal, the 21-year-old spoke to reporters about the latest chapter in his spellbinding career. Question: Your captain Philipp Lahm recently said in an interview that you may as well be branded a goal-getter, given the number of goals you've been scoring. Is that fair? Joshua Kimmich: A goal-getter consistently scores over many weeks – I've just scored in two or three games. This was an important late goal today, but we should have scored before, particularly in the second half. Kimmich: The ball jumped up a bit and I can remember thinking to myself that I couldn't bungle it because there wasn't much time left. Fortunately I didn't have much time to think about it because the ball came in pretty quickly and I just stuck my foot out and hit it right. Kimmich: We expected it to be tough here in Hamburg. We lacked ideas and were a bit static and things weren't quite clicking for us. We improved in the second half, when we had a bit more movement and we created more chances.